Mr. Russell, who lived for many months among bears in eastern Russia, concluded that the animals were not naturally hostile to people. NEW YORK — Charlie Russell, a Canadian naturalist who researched grizzly bears by living among them and argued for a view of the animals based on coexistence rather than fear, died Monday in Calgary, Alberta. He was 76. “I believe that it’s an intelligent, social animal that is completely misunderstood,” he said in a PBS “Nature” documentary about his work. To prove the point, he and his partner at the time, Maureen Enns, a photographer and artist, spent months each year for a decade living among bears in a remote part of eastern Russia. They wrote several books based on those experiences and were the subject of documentaries and countless articles. Mr. Russell’s ideas, though, were not embraced by everyone. Some fellow naturalists worried that they might lead people to be unwisely casual around wild animals. And in Russia, Mr. Russell ran afoul of criminal elements and corrupt politicians tied to bear poaching. His and Enns’s experiment on the Kamchatka Peninsula ended heartbreakingly. When they returned there for the 2003 season, they found that almost all the bears they had become acquainted with were gone, presumably slaughtered. A bear gallbladder — the prize for poachers, valued in some countries as an aphrodisiac and general health remedy — had been nailed to their cabin wall, like some kind of warning. But he continued to promote his views, and they have influenced policy and practice in areas where bears and people encounter one another. Andrew Charles Russell was born in Pincher Creek, Alberta. His parents, Andy and Kay (Riggall) Russell, ran an outfitting business; his father led guided horseback adventures into the mountains near the family ranch, trips that might last three weeks. Andy Russell was also a noted naturalist and writer, and when he decided to make a documentary about the white subspecies of black bears on Princess Royal Island in British Columbia, he took Charlie and his brother Richard along as assistants. The experience, Charlie said later, helped him begin to think differently about bears. The three found that they were mostly capturing footage of bears’ backsides as the animals ran from them — until they left their rifles behind when they went out to film. Mr. Russell became a rancher on the family land in Alberta, and he began to wonder if the traditional rancher view of bears as an enemy was fair. Van Tighem said Mr. Russell, who had no college education, was not interested in studying bears in the usual way. But to really get at the innate nature of bears, he needed to find ones that had no history of negative encounters with people. That is what sent him and Enns to Kamchatka, which had been off limits to civilians for military reasons during the Cold War and thus was full of bears that had no contact with humans. They first scouted the area in 1994. In 1996, Russian officials granted them permission to build a cabin near a remote lake. Every year they would fly in, using a small plane Mr. Russell had built from a kit, and stay for four or five months. The bears grew to know them, he said, and became comfortable enough with them that sometimes a few would come to the cabin and linger to see if he and Enns wanted to go for a walk with them. The couple also won permission to bring in three orphaned cubs from a Russian zoo to try to reintroduce them to the wild, and they succeeded despite the skepticism of some naturalists. They would eventually work with a total of 10 orphaned cubs. While elsewhere in the world naturalists were studying bears by tranquilizing and putting trackers on them, or doing chemical analysis of their blood and bodily wastes, Mr. Russell wanted no part of that. “I don’t care how many miles a bear walks in a day or how many mouthfuls of grass it eats,” he told Backpacker magazine. He cared, he said, about only two things: what annoyed bears and what didn’t. His conclusion that bears were not naturally hostile to people earned him enemies among hunters. “A lot of it is because the hunting culture needs to promote an animal as fearful so that people can feel brave about killing it,” he told the Australian newspaper The Age in 2009. His live-with-the-bears approach also drew criticism from some wildlife officials. “He’s teaching people how to get mauled,” one said. Sometimes people were indeed mauled — most memorably in 2003, when another bear advocate, Timothy Treadwell, and his girlfriend, Amie Huguenard, were killed and partly eaten by a bear in Alaska. Mr. Russell, though, had always advocated taking precautions, like carrying pepper spray or using electric fencing, and had criticized Treadwell for not doing so. “I have always understood that for the bears’ sake it was very important that I did not add to their problems by making a mistake myself that caused me to be hurt or killed,” he wrote on his website in response to those deaths. The incident, he said, played into the hands of hunting interests, which were starting to lose the public-relations war as bear-viewing tourism grew. “Hunters desperately needed Timothy’s blunder to put the danger back into bear encounters,” he wrote. 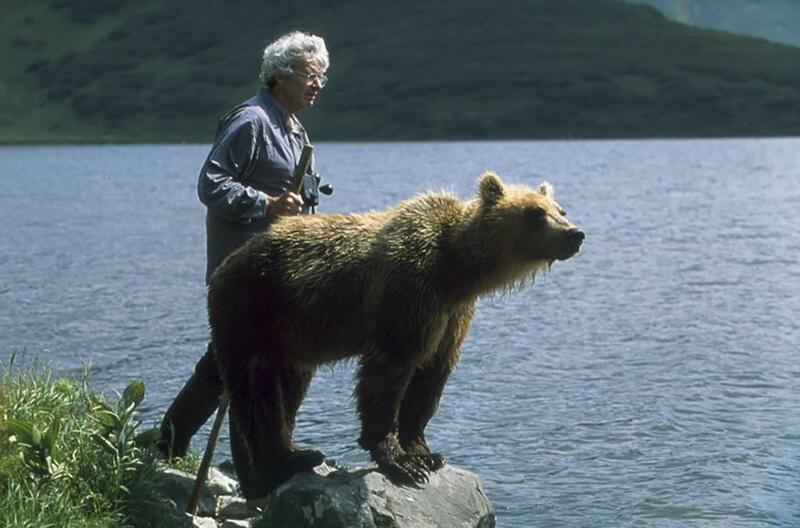 Books by Mr. Russell and Enns include “Grizzly Heart: Living Without Fear Among the Brown Bears of Kamchatka” (2002) and “Grizzly Seasons: Life With the Brown Bears of Kamchatka” (2003). Their relationship ended in the aftermath of the slaughter of the Kamchatka bears in 2003, an incident that also left Mr. Russell with the fear that, by teaching the bears to trust humans, he had inadvertently conditioned them not to run from the hunters. Mr. Russell’s marriage to Margaret Hynde ended in divorce in the early 1970s. In addition to his brothers, he leaves a sister, Anne Raabe, and a granddaughter.